When Mike and Megan visited the Humane Society of West Michigan, they were hoping to adopt a kitten to their fur family. They already had three cats at home and felt like they were ready for another addition. But when they walked into the shelter, they literally could not miss Bronson, a big, fat, 33-pound cat. Of course, they had to stop and pet the huge furball, and Bronson started happily purring away and kneading his comfy bed. That’s when the couple noticed that Bronson had thumbs, and they made his paws look like their home state of Michigan. Mike and Megan couldn’t resist falling in love with Bronson. The shelter told them that the three-year-old cat came in as a surrender, but they didn’t know much about him or how he got in such a state. It’s possible that he had an owner who fed him a poor diet or wasn’t able to provide him with exercise. The shelter wasn’t even sure if Bronson was mobile, as they hadn’t seen him walk since he got there. Once the couple understood Bronson’s needs, they decided to take him home and get him into shape. The next day, Bronson shocked Mike and Megan when he got up and started walking around, exploring his new surroundings. They were also surprised to find out that he liked playing with toys and wasn’t particularly food motivated. In fact, he sometimes didn’t even finish his vet-prescribed amount of food for the day. This worried Bronson’s new owners, as they thought he might start losing weight too quickly, which can be very harmful to cats. The couple has worked with Bronson’s vet to find a food and workout regimen that works for him. They keep him active during meal time by moving his food, they encourage play, and they provide him with plenty of physical activities. He’s already down to 31.7 pounds, which is slow, steady, and safe progress. It’s not always easy, though. Bronson has difficulty with mobility and sometimes can’t even reach to clean himself. Mike and Megan run a wall-mounted cat furniture company, and Bronson doesn’t seem to be quite ready to jump up to test it out. He might be too heavy for it, anyway. But hopefully, as he sheds the pounds, he’ll be able to move comfortably again. In the meantime, Bronson has come out of his shell a bit more and enjoys playing with the other cats, getting pets and scratches, and being part of a loving family. 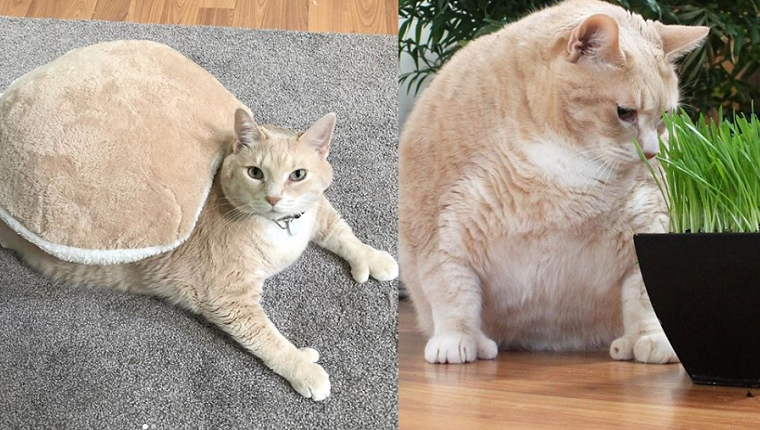 You can follow Bronson’s weight loss journey on Instagram by following @iambronsoncat. Are you happy to see Bronson in a loving home and losing weight? How do you think Bronson got so big in only three years? Let us know in the comments below!